Why handle and store hazardous gas chlorine or bleach when a safer, cleaner and purer alternative exists! Take a closer look at the Electricide® electrochemical chlorine generator. The Electricide® electrochemical chlorine generator is safe and operator friendly, producing pure chlorine gas or the purest possible sodium hypochlorite solution. One non-hazardous precursor chemical is used: Electricide-B1 and electricity. Lowest running cost is available, due to the high efficiency of chlorine generation in the electrolytic membrane cell with gas separation. The Electricide® chlorine generator can replace gas chlorine storage for potable and process water disinfection. Do you have concerns with the safety risk of storing chlorine gas in 70kg cylinder or 920kg drums, with the potential consequence of an uncontrolled leak? The Electricide® chlorine generator removes this risk by making chlorine only when it is required. Chlorine is not stored, but is an intermediate product: generated then immediately dosed. The only chemical stored is Electricide-B1, which is a non-hazardous brine (salt) solution – easy to transport, store and handle with no safety risks. No connection of cylinders or drums by operators. No unloading of cylinders or drums from trucks. 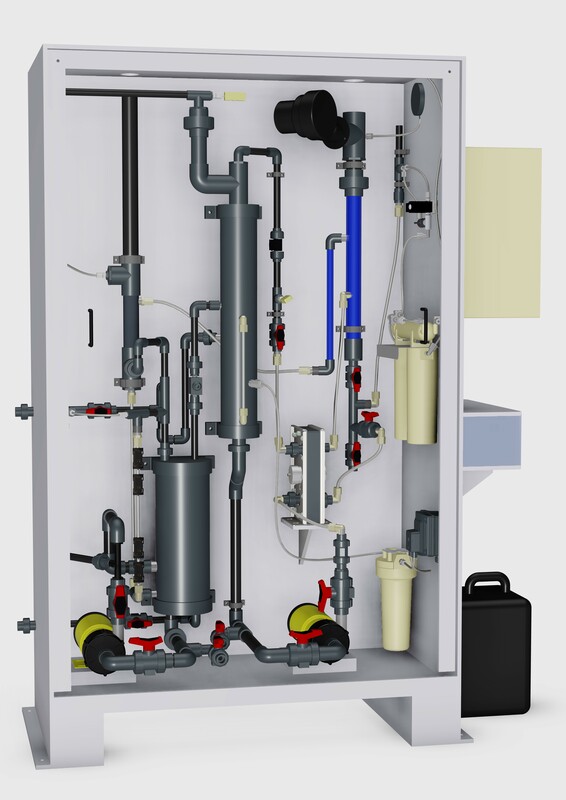 For replacement of existing gas chlorination systems, the existing booster pump, ejector and chlorine leak detector can be reused, reducing the retrofit cost. Many sites have to manage frequent deliveries of bleach – commercial sodium hypochlorite from tankers into bulk storage tanks. There are safety risks associated with unloading, storage and dosing of this chemical. Commercial sodium hypochlorite (12%) undergoes degradation to oxygen and chlorate with the speed of degradation related to temperature, pH, concentration and impurities. Typical 120 g/L sodium hypochlorite comes immediately from the manufacturer with 1.5 g/L chlorate ion present. The Electricide® chlorine generator produce sodium hypochlorite solution at 2-30 g/L and pH 8.5-9.5. This medium concentration hypochlorite solution is low in sodium, chloride and chlorate. It is lower in sodium and chloride than other electrochlorinators because chlorine gas is generated, extracted with air, redissolved into caustic catholyte and is very stable in storage. Some of our customers are located in remote areas where sodium hypochlorite is expensive to purchase or deliveries are unreliable. The bleach supplier will often require large bulk tanks to be installed to ensure low frequency of deliveries. This is a problem because bleach degrades in storage and at the middle-end of the tank volume, hypochlorite concentration is low and chlorate concentration is high. The Electricide® generator is a flexible source of sodium hypochlorite as it makes the chemical, fresh, as required. For sites that have an existing bulk tank for 12% sodium hypochlorite, the Electricide® generator can be installed to top up this tank and therefore, tanker deliveries will cease. How Does the Generator Produce Chlorine? Chlorine gas reacts with caustic catholyte to form sodium hypochlorite and salt. Dioxide Pacific offers the the Electricide® generator as a complete package including Electricide-B1 chemical supply and maintenance. Remote internet access enables viewing of generator operation at any time and from any location via an internet browser – to just check the system is operating correctly, make an adjustment to a setpoint or reset an alarm. PLC or HMI program changes can be made without having to attend site. Remote internet access adds up to lower maintenance costs for you. Why send a technician to site when there is no need for it! Dioxide Pacific provides a huge library of “how to” technical and training video resources for your use, all accessible from our website. For instance, we have videos for: “how do I test the performance of the electrolytic cell”; “how do I test chlorine dioxide strength”; “how do I replace a metering pump”. In most cases, you can safely perform maintenance on the generator without involving our technicians. If you would prefer Dioxide Pacific to handle some or all of the maintenance, of course we can provide technicians for this. Why not lease the system? Instead of purchasing the chlorine dioxide system, you could consider the Dioxide Pacific total service contract. Under this arrangement, either direct or through our distributor network, we will provide the equipment and maintain the unit at your site and all you need to do is provide a fixed monthly fee for the use of the equipment. Your capital is released to use in your core business. Electricide-B1 can be supplied in 200L (52 Gal) drums or 1,000L (260 Gal) IBC’s (totes). Electricide-B1 is not a hazardous chemical and no specialised spill containment is required. 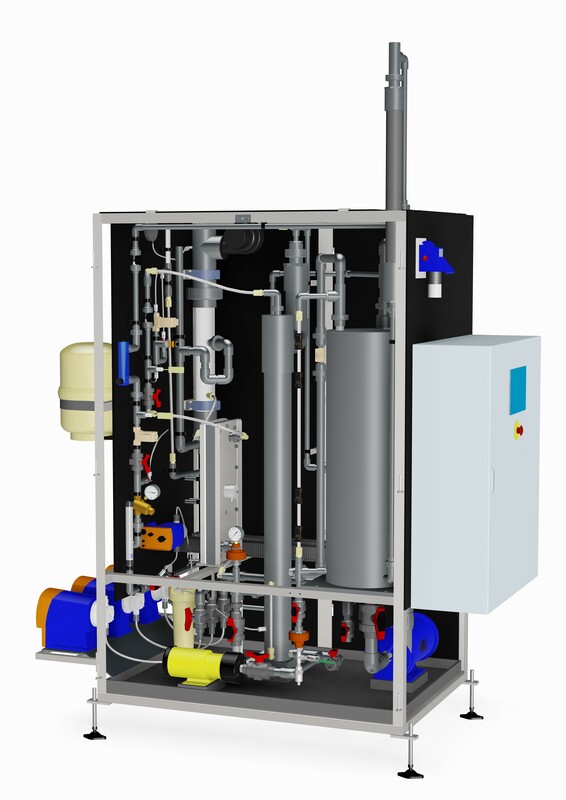 Dioxide Pacific offers turnkey systems including design drawings (P&ID, 3D model and GA), installation (mechanical and electrical) and commissioning. Our quality project management system ensures the plant will be installed on time with the smallest possible interruption to your site. We have proven risk management protocols written specifically for chlorine dioxide systems to ensure that installation, commissioning, training and operation of the plant is extremely safe. Electricide® Chlorine systems can be installed in dedicated plant rooms, skids for transportation to remote sites or in portable buildings. 1 Level (pressure) transmitter – display on HMI ? 1 4 L/hr (1.1 GPH) @ 10 Bar (145 psi) (low pressure option) ? 2 23 L/hr (6.1 GPH) @ 4 Bar (60 psi) (low pressure option) ? 3 4 L/hr (1.1 GPH) @ 10 Bar (145 psi) (high pressure option) ? 4 8 L/hr (2.1 GPH) @ 7 Bar (105 psi) (high pressure option) ? 5 23 L/hr (6.1 GPH) @ 7 Bar (105 psi) (high pressure option) ? 1 Suction lance for 20L (5 gal) drum with foot valve only ? 2 Suction lance for 20L (5 gal) drum with foot valve and level switch ? 3 Suction lance for 200L (55 gal) drum with foot valve only ? 4 Suction lance for 200L (55 gal) drum with foot valve and level switch ? 5 Suction lance for 1000L (330 gal) IBC (tote) with foot valve and level switch ?